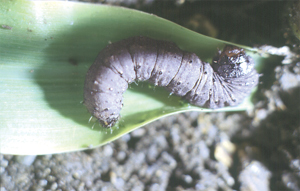 Cutworms can attack crops virtually anywhere in the Midwest. The importance of a particular species of cutworm varies with location and season. 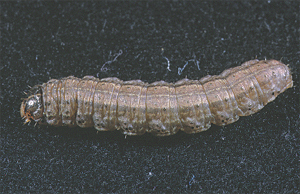 Often an infested field will have a mixed population of several species of cutworms. In most cases, the individual species in the field is of little importance with respect to making a control decision. Cutworm controls in soybean are essentially the same regardless of species. Early diagnosis of a cutworm infestation is essential. 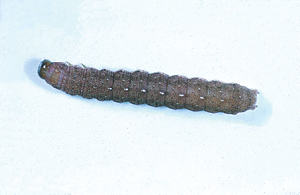 The bodies of cutworms are cylindrical and may vary in length from 1/8 to 1-1/2 inches (3 to 38 mm), texture, and color depending on the species. Often, 3 or 4 different sizes of cutworms will be noted in a typical field collection. Most cutworms overwinter as pupae in the soil or as young larvae, however some move into the Midwest as moths from southern latitudes. After emerging or arriving in the Midwest, moths mate then deposit eggs on soil, weeds, and/or crops (arriving moths may have already mated). Cutworm damage may be prevalent where soybean is planted or replanted late (e.g., bottom ground wet from spring flooding) and in fields with weedy growth. 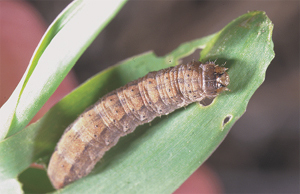 Cutworm presence may be evident before or after planting on several types of host plants. Early cutworm feeding may include holes chewed in leaves. Leaf margins may appear ragged. 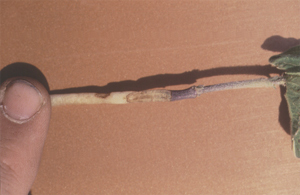 For most cutworms this above ground injury occurs early in the cutworm’s developmental stages. At this time, young worms feed above ground at night or on cloudy days. Older, larger worms often cut plants above, at, or below ground level. Larger cutworms tend to remain below the soil surface, especially if the weather is dry and the soil surface has crusted. Cutworms remain hidden in the soil during the day, but may feed throughout the day below the soil surface. 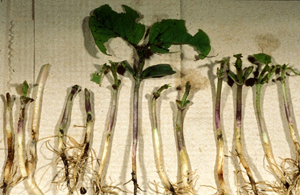 To find them, examine the top 3 inches (7.6 cm) of soil around damaged plants. Some cutworms may be easily overlooked because their body colors blend in with the soil. Walk fields as plants emerge to monitor for cutworm damage. Check 20 plants in each of 5 areas of a field (100 plants). Record the number of cut or damaged plants for each area and the field as a whole. Look for leaf feeding that may be due to cutworms too small to cut plants. Check the field again in 24 to 48 hours. Be sure to monitor those areas of the field where cutworms are most likely to be found (wet, weedy areas). Also, look for live cutworms around damaged plants. Collect 2 cutworms from each sample set for a total of 10 and record the length of each worm. Determine the average length for the worms sampled. Also, determine the species causing the damage.